When it comes to working out, wireless headphones can be amazing: No cord feedback while you run, no catching wires on the Olympic bar, no carrying your phone around because the wire is too short. And Monster’s iSport SuperSlim wireless earbuds aren’t just wireless, they’re wireless without the crazy bulk that most wireless earbuds come with. I mean, it’s right there in the name–these “super-slim” earbuds are about half as thick as other wireless earbuds I’ve used. The iSport SuperSlims are the slimmest wireless earbuds on the market, but that doesn’t mean they’re paper thin. They are slimmer than Yurbuds’ Leap wireless earbuds, but they’re thicker than SMS Audio’s BioSport earbuds (which aren’t wireless, but are thicker than average thanks to a built-in heart rate monitor). And let’s not even compare them to wired earbuds, because they’re nowhere near that slim. The SuperSlims’ audio performance isn’t great. Still, the iSport SuperSlims are a step up, size-wise, from most wireless earbuds. The SuperSlims have soft round earbud covers and flexible fins to help them stay in place; a three-button remote (volume up/down, pause/play/skip/pair); and the buds are connected to each other with a rectangular, tangle-proof wire. “Wireless” earbuds, after all, aren’t completely wire free–there’s still a wire that connects the two earbuds and wraps around the back of your head. In the box, you get three different sizes of earbud covers and fins (which are, nicely, labeled by size and side, so you don’t have to rely on eyeballing the size difference), a micro USB charging cable, and a drawstring mesh bag for storage. Although Monster attempts to make your life easier by labeling the fins, fitting the iSport SuperSlim earbuds is a tad tricky. The earbuds go into your ear canal, while the fins are supposed to lock into your ear’s cymba conchae—that little notch above your ear canal. Usually, you can get earbuds like this to lock into your ear by inserting them and then twisting until the fin is in place, but the SuperSlims need a seasoned touch—it took many tries before I felt like they were properly in place. If you were using these as your regular workout headphones, you’d probably end up getting the technique down, but they’re not terribly user friendly right out of the box. The iSport SuperSlim really are thin, which is doubly impressive considering their wireless design. The wire that connects the earbuds is rubbery, which seems like a logical choice considering most tangle-free workout headphones sport rubber-coated wires. But since this wire is so short—and there’s little chance of it actually getting tangled—the rubber coating is just uncomfortable if you have hair. Even when my hair was in a ponytail, the wire had enough friction that it caught on my hair enough to occasionally pull an earbud out. The wire does have an attached shortener, which is useful for cardio workouts, or workouts in which you don’t more your head around too much. Setting up the SuperSlims is easy. To turn them on, just press and hold the middle button on the remote. To pair them with your device, press and hold that middle button a bit longer, and then search for “iSport Wireless Superslim” on your device’s Bluetooth list. After you pair them once, they should stay paired the next time you turn them on within Bluetooth range. The SuperSlims are wireless, which means they have a battery, which is recharged through a small, covered slot on the front of the right earbud. Battery life isn’t great for Bluetooth headphones—just over five hours, according to Monster—but I don’t know many people who work out for five hours at a time. 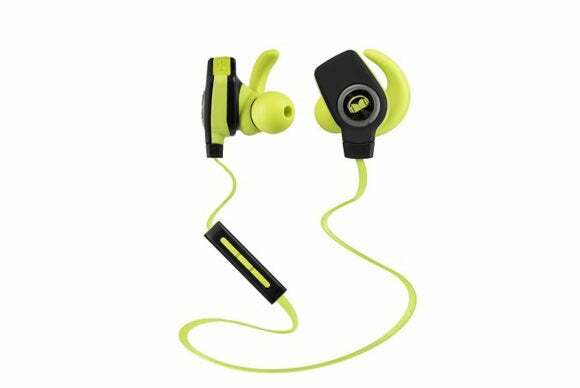 These earbuds should last you through a couple of workouts before you need to recharge. The SuperSlims’ audio performance isn’t great: Mid-range frequency response is pretty good, but they’re very bright at the high end. Bass response isn’t as impressive, but at least it avoids being muddy. I’m really into bass and EDM, and these earbuds founder with that style of music; but if you lean more toward the peppy vocals of Katy Perry tracks during your workouts, you might have a different opinion. Should you break out your plastic? Monster’s iSport SuperSlim wireless earbuds aren’t for everyone, but they will appeal to a certain audience. Some people like to overdo the treble as much as I like to overdo the bass, and these headphones are them. While they’re a little tricky to put on, they are slim enough to wear under a helmet, so they’re a good choice for cyclists, too.